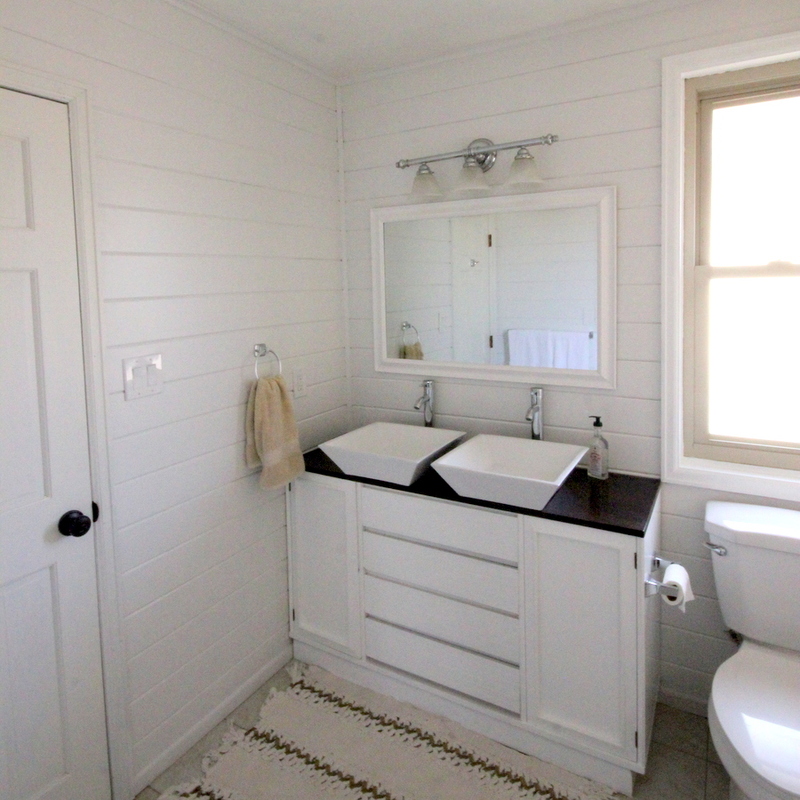 We didn’t quite have the time to do a total overhaul on the upstairs bathroom like we did downstairs. 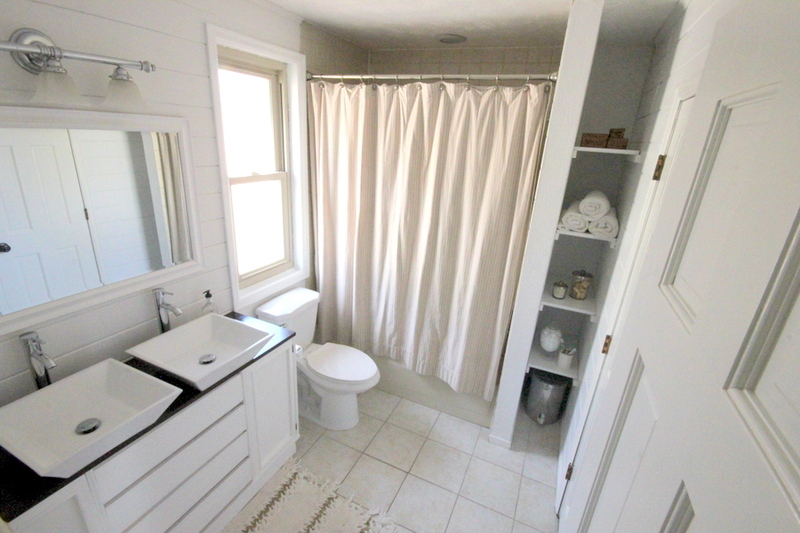 However, with only a couple hundred dollars and some paint, we did have the chance to give this bathroom a mini renovation. 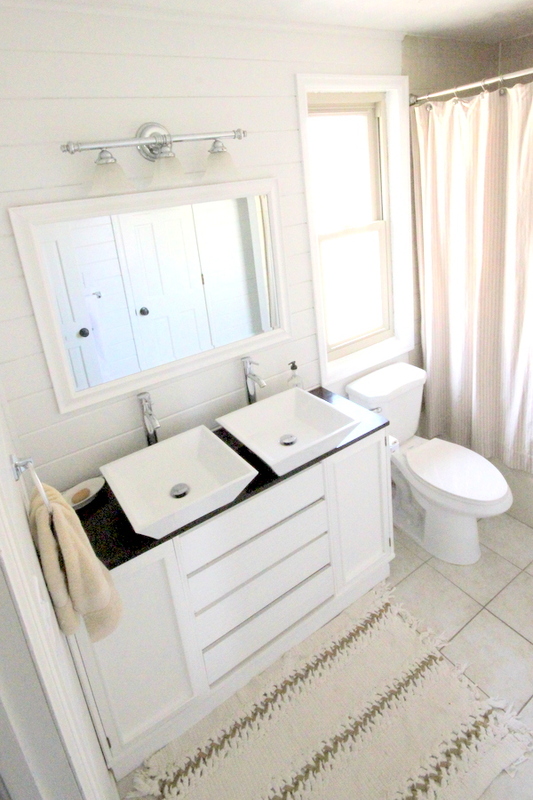 The main must-go-now component was, strangely enough, the white vanity. As far as ugly vanities go, we have seen (and replaced) far worse. However, what this vanity lacked in glaring atrociousness, it made up for in dysfunctionality. Not only were the drawers shoved into spaces that were slightly too big (causing them to often fall right out), the faucet leaked constantly, the tile countertop was bland and ugly and the sink was even worse than the countertop. 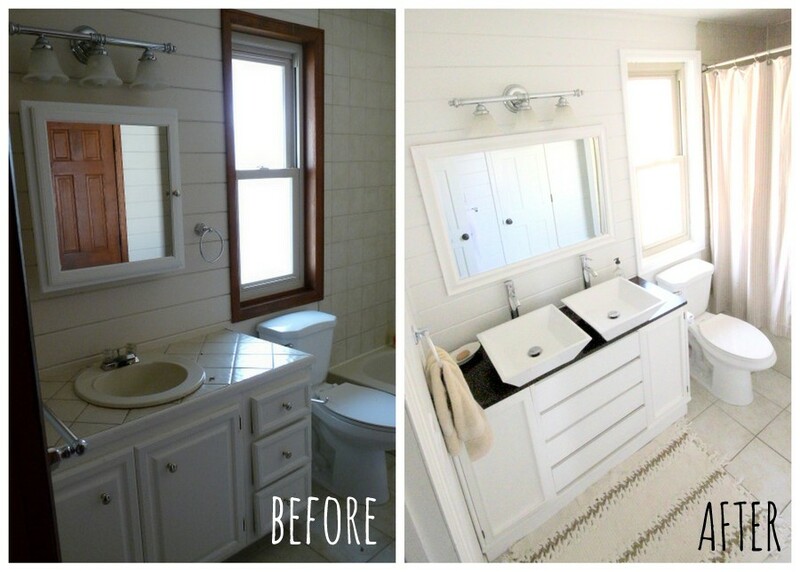 Besides replacing the defunct vanity, sink and faucet with a dresser and vessel sinks, we painted over the bandaid-ish taupe walls, replaced all of the hardware, painted the wooden trim white, redid the 1980s country shelves, and added a new mirror. 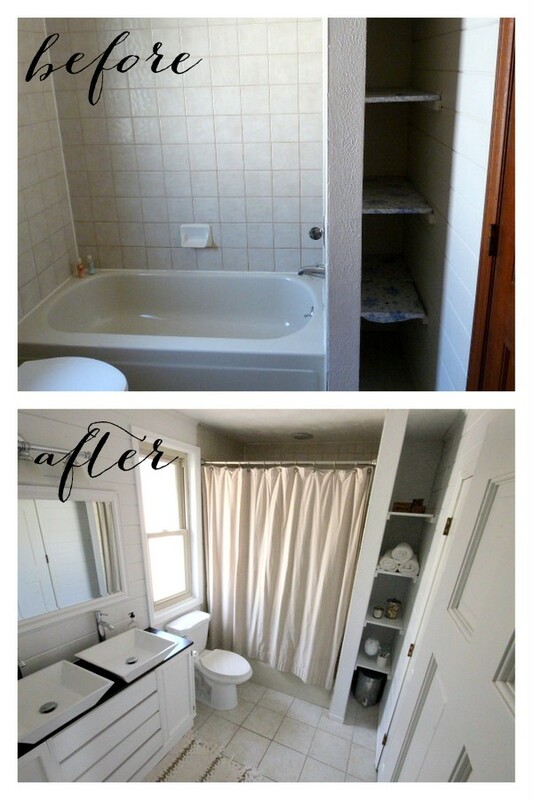 Add neutral accessories and mini bathroom makeover is complete! 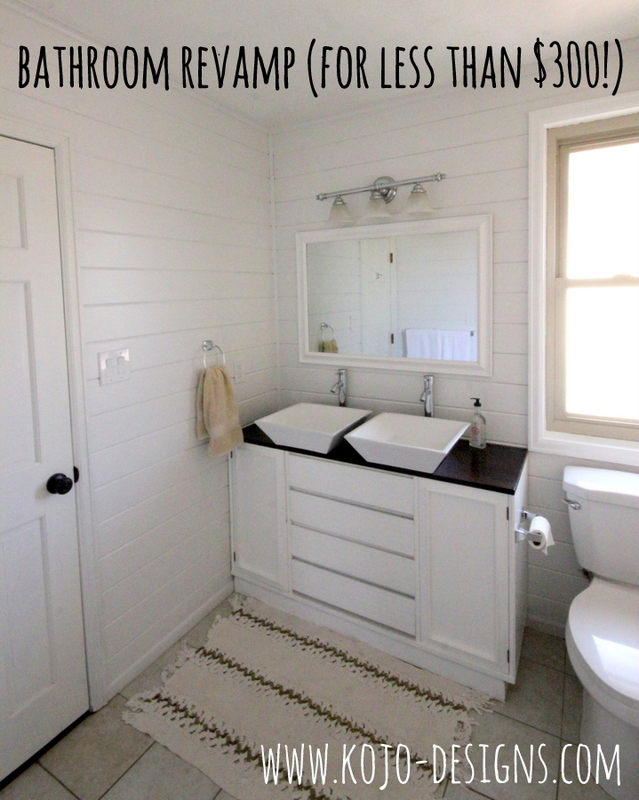 Even though I am definitely partial to complete overhauls (especially in bathrooms! ), I love the difference in this room after $280 and some paint! That’s amazing! 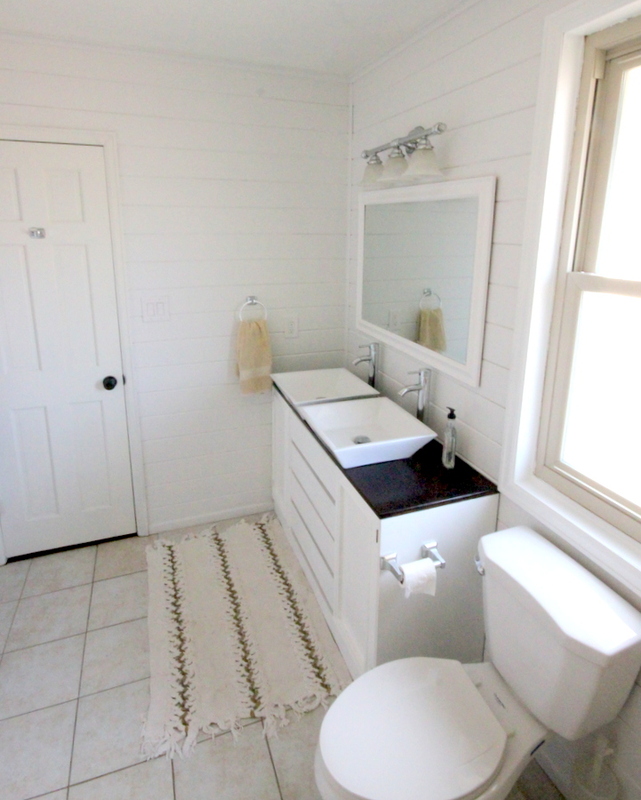 I love it…..that vanity really turned out great! Good job! I love this bathroom! and how it was such a cheap, and fairly simple update. 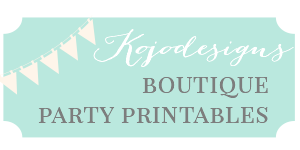 Love your blog, just don’t usually comment. Hope all is well for you now that you’re on the other side of the world! Thanks Rachael- for the kind words about the bathroom and for the well wishes as well! We are doing well, trying to settle in, hoping it isn’t always this hot!?! 🙂 Thanks for commenting!